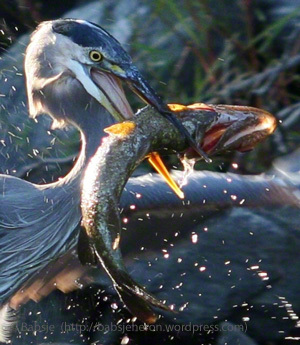 ← Great Blue Heron’s Artistic License? And when I’ve reached the end of my days, may I be found with a Great Blue Heron’s nest built within my ribcage. Thanks to Jen H and WordPress for this week’s WPC Challenge: Satisfaction/. In more than a dozen years kayaking that area of the lake, I had observed a Great Blue Heron atop that tree pedestal only once – and at that time, before I could raise the camera, a pod of kayaks approached from the north, flushing the Great Blue. It was very satisfying to finally stumble across her there two weeks ago. I observed through binocs and telephoto lens from a distance for nearly an hour as she slept and then preened and then slept some more, perched on one leg the whole time. Thanks also to Paula for hosting her Thursday’s Special: Slow. It was a slow hour spent watching the Great Blue Heron languidly perched atop her pedestal. I was grateful to be in her presence, the two of us alone in a fine drizzle in the cove. Posted on August 10, 2017, in ardea herodias, Art, Audubon, Bird photography, DPchallenge, Great Blue Heron, Nature, Photography, Photography challenge, postaday, Weekly Photo Challenge, Wildlife Photography and tagged Five Crows, great blue heron, TCAN. Bookmark the permalink. 31 Comments. She is beautiful. How can you tell she is a girl? Much appreciate your kind words. Maybe should be applying myself elsewhere however. Those are very excellent words, thank you, Babsje. You might well have hit a big nail on the head there too. It’s good to boil things down to basic tenets. I shall go ponder. Am so glad you enjoyed the visit to Scarthin Books. Glad you finally captured her! Magnificent and great tip on The Old Ways…..I must get that…you find such great literature and poems on nature and herons specifically. Yeah that is a great thing really, I was thinking to mine your site for some good ones and look up the authors. It is cool to put the heron poetry together like a collection. LOL, oh I didn’t mean in the disrespect of intellectual property sense, just following those links of yours to find the poetry too. As you say poems with herons specifically are best found in a serendipitous manner as I have done searches looking at times and came up fairly dry. Sorry for the misunderstanding. I am on the same page on attribution. In fact this is why I don’t use Google. They scan copyrighted books and expect the authors to find them and decline rather than ask permission first. That defeats the purpose of copyright. Ouu just saw you mentioned Google, that’s ok, I just am philosophically reluctant to go there unless I have to. But point well taken. Sorry.